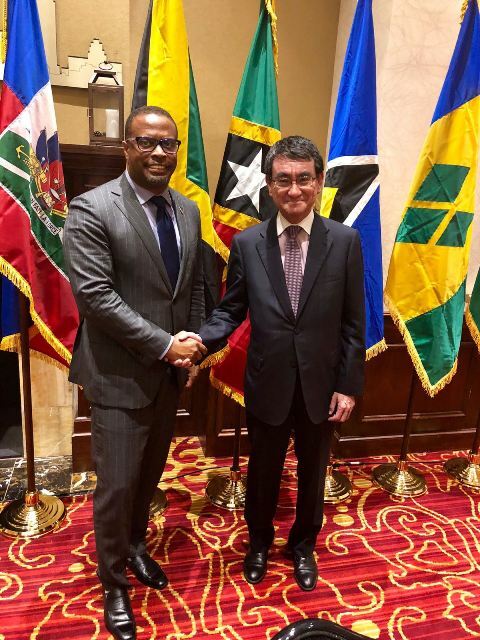 September 25, 2018 (Ministry of Foreign Affairs): Honourable Mark Brantley attended the 6th CARICOM-Japan meeting within the margins of the high-level week of the 73rd Session of the United Nations General Assembly on Monday 25th September 2018. The meeting presented an opportunity for CARICOM and Japan to discuss critical issues of mutual interest, in particular, the state of affairs in Asia and the implications for the Caribbean region. The CARICOM Foreign Ministers also sought Japan’s support in the advocacy of the development of disaster risk reduction framework as well as the adverse effects of Climate Change. After the recently concluded first intergovernmental conference to begin negotiations on the international legally binding treatment, the Ministers also discussed the sustainable use of marine resources.